Some of you from the Fort Smith area may know Meagan Matlock. She is one sweet, successful, beautiful person who is also the owner of Hazel’s Haven. Hazel’s Haven is one of Fort Smiths best fashion boutiques so if you haven’t checked it out, go! You won’t be disappointed and while you are there thank Meagan for this blog post. Meagan has a generous heart and was nice enough to open up and tell us all about her Melanoma experience. Without further delay, here are a few questions Meagan answered about her melanoma diagnosis in honor of Melanoma awareness month coming to an end. How and when were you diagnosed with melanoma? First, let me offer my background info leading up to the point where I am today… I tanned in tanning beds off and on year ’round from the time I was probably about 16 and could drive myself to them. Had I known better, like with many things as we grow wiser with age, I would have done this in moderation; instead, I was a regular. I did not feel pretty unless I was tan. And, I felt that it helped keep my skin clear. So…I tanned in a bed a lot and in the Summer we lived at the lake on the weekends or I’d be at a pool if we were in town. And you can probably guess…I rarely used a sunscreen. Mayyyyybeee like spf of 8 unless, of course, I got burned (which happened many times over the years) then the following day I would wear a higher spf or keep in the shade (I wasn’t completely ignorant!). But, all in all, I did not take care of myself like I should have. We ALWAYS think “it won’t happen to me…surely.” Ok, so cut to a few years ago. I was checking my back side on my way out to the pool and on the small of my back I noticed a new dark “freckle.” Over the course of a couple years it never bothered me. It was flat and never changed that I could tell. Randomly I would have my husband look at it but we never really thought much of it. I have had a lot of new, small little “freckles” pop up on my stomach/shoulder/arms/legs but that’s pretty much the only one on my back that really stood out – mainly because it was a loner and it was dark. Long story short (and a total God thing) I had a couple conversations this January and it made me think about that spot and that I should go just get a skin check since I never had before. Had it not been for the fact that I am a mother, I might not have even gone. Something about knowing you have a life dependent on you sure changes your perspective on many things. So I called my friend Nina and she had me come in her office in February. She removed that spot and another. A week later she called me and said that the spot I was curious about was, in fact, melanoma. How did you feel when you had melanoma? Honestly, at first, I didn’t know what to think. I guess I didn’t realize the severity of it and just how lucky I was that it hadn’t spread…and how careless it was of me not to have taken better care of myself and have checkups! I knew that people I had known distantly had died from it but I never really had been thoroughly educated on it. Nina helped calm me and explained it all very well to me. How was your melanoma treated? I had to go in and have them remove the parameters to make sure it hadn’t spread. Thank the Lord it had not. It was a simple procedure. They numbed my back and cut the skin out. Has your lifestyle changed at all now that you know you have had a melanoma? Yes! Absolutely. Now I will always, always coat myself in sunscreen. You can still get a tan by doing so–I’ve learned the sun is very strong. With age and maturity and confidence in who I am I have also learned that being tan does not make you beautiful. Sure, we all feel better with some color, but I am not nearly as obsessive over it as I used to be. I have a little girl who is observing my every move. I don’t want her to hear me say “I’m not pretty without a tan” because that is so false. I think pale skin is just as beautiful…I just had a hang-up for a very long time. Don’t get me wrong, I love a good spray tan and I love a sun-kissed look, but I have learned that everything in moderation is key. And SPF and skin check-ups are a MUST!!! What follow up do you have now that you have had melanoma? I will go every 3 months for a year since I am considered high risk. Then, after that, I will go once or twice a year. Plus, I know now to just really watch closely myself and not wait 2 or 3 years when I am suspicious about a spot. What would you tell the 12 year old you about melanoma? Oh gosh… a lot of what I mentioned in question #4. There is nothing wrong with living your life, having fun at the lake or pool or beach. It just all goes back to moderation and common sense and the desire and knowledge to want to take care of yourself. Don’t bask in the sun from 11am-4pm during the strongest hours of the sun without reapplying a strong SPF– or an even wiser thing would be to NOT be in the sun THAT LONG. Ha! What do you want people to know about the full body skin exam? The biopsy? The surgery? The scar? I would encourage anyone (and you can bet I have encouraged my close family and friends!) to go. It is not a big deal at all. I am super modest, but my friend Nina and her co-workers made me feel comfortable. It’s a quick check that won’t take much time but could potentially save your life. Getting a mole removed is pretty much painless, same as the surgery..although I’ll admit I dislike needles and the tugging of numb skin makes me kinda wanna vomit, lol! But, truthfully, none of it was a bad experience. My scar is pretty large and noticeable. My surgery was in February and here it is May and it’s still pretty pink. They did offer a free laser treatment (that felt like a rubber band popping your skin with a burning sensation to it) and that has seemed to help. I do put healing oil on it to help as well. Hey, I can deal with a scar. What I can’t deal with is the thought of not catching it in time… telling myself it was nothing… and the likelihood that it could and would have spread had we not caught it in time. I plan to get 1 or 2 more laser treatments done to help with the redness of the scar. As an influential business woman in our community does having a melanoma change how you role model to girls? First of all, thank you for that flattering, humbling title you just gave me. I really appreciate your perspective–it’s funny to hear things like that! =) My heart goes out to girls and women of all ages and the pressure on us all to look and feel a certain way–it’s absurd. I have been in retail for most of my teen/adult life working around women every. single. day. I hear women cut themselves down every. single. day. I hear them point out their “flaws” that none of us would ever even recognize every. single. day. It truly makes me sad and hurts my heart for the things that Haven might go through and the skewed view she could possibly have of herself. I grew up hearing my mother speak of her insecurities my whole life and she is such a beautiful, kind, classy woman. Every woman does it. But we need to stop and think about how we talk about ourselves (and other women) in front of our children who are so easily influenced by the things they hear us say. Don’t get me wrong, I am not preaching TO anyone…I am just as guilty but I am definitely a work in progress, trying to be more mindful so that I can be uplifting and a positive example to not only my daughter, but to my clientele who shop in my store. I am lucky to have a husband who builds me up and calls me out when I say mindless, stupid, negative things about myself. I would want women and girls of all ages to learn though my experience of being in the fashion industry plus my melanoma scare that beauty does not equal tan skin. Beauty does not equal a size 0 or 2. Beauty does not equal a certain hair color or certain brand of clothing. Beauty is how you are behind closed doors & what’s really inside your conscience…not just some empty kind comment you put out there on social media. I’ve seen people post nothing but uplifting, kind things but have witnessed or heard from reliable sources of those people not acting in public to other people quite what they preach. We all have ugly moments and they do not define us unless you are guilty of those ugly moments more than not. Beauty is taking care of yourself, loving yourself and embracing the unique blessings that God gave only to YOU. Beauty is how you treat others and the true desires within your heart. Due to my experience I will never be a person who judges and nags someone else for practicing unsafe sun habits. All I can say, if asked, is be smart and do EVERYTHING IN MODERATION. How did your family and friends react when you told them you had melanoma and how did that affect you? I’d say they were shocked just because, like I said earlier, you never think of anything hitting close to home…until it does. Of course, they were supportive and I know of several who have had skin checks since I found out. I am so glad that my life experience encouraged others to take better care of themselves and maybe go for their first-ever skin exam. I’ll admit, there was a weak moment I had one morning where it hit me what I was dealing with and I got pretty emotional, but I snapped myself out of it and felt quite foolish because many people do not get as lucky as I did. Things could have been worse. Now I know that I am susceptible and that’s that. I will go for skin exams regularly. I will use SPF on myself and my family members. Everything in moderation. Do you have a family history of Melanoma? Thank you to Meagan for her insight! My little girl is officially 3 weeks old. I have reached the point where my only daily hygiene goal is to brush my teeth. I have no idea what day of the week it is and when the barista at Starbucks gives me the evil eye as I order a double shot espresso with a baby screaming bloody murder in the back seat I just laugh crazily, like Cruella Deville. With that being said I’m a bridesmaid in a wedding on Saturday. Not just any wedding, Honey, my work sister’s wedding. She is not only a wonderful dermatology physician assistant to work side by side with, she has become one of my best friends. She is a good person who makes me a better person which is what makes friendships the best. I would do anything for her! So I gotta pull myself, and my two kids under two, together and get to Tulsa this weekend to help my girl celebrate the union of her and the love of her life! My skin has to look in tip top shape and I must admit my skincare regimen is kind of falling to the bottom of my list, I mean I can barely remember when my last shower was! Here are some simple tips to live by the week before a big event for having your skin look the best it can look! 1. No new products- Don’t go to the drug store and try a new acne treatment or new face cream. If you have a reaction to something you have never tried before, you’ll have to deal with a rash on your face which can be a bigger problem than what you started with. 2. See your dermatologist- Make an appointment with your dermatologist the week before your big event for any acute things you need taken care of before the big day. If you don’t need it you can call and cancel but don’t try to be rushing around to get it at the last minute. If you get that dreaded pimple there are some things we can do like inject it with steroid or laser it to make it go away in a hurry. 3. No facials- I know that manicure, pedicure and facial right before the wedding sounds like a fun thing for all the wedding party to do together or just a way to spruce up. However, if you have any irritation from these products or any other complications you don’t have a lot of time to fix it. 4. Wear sunscreen- The last thing you want is for dark spots on your face and chest to get darker before the wedding. Tan lines look super tacky and a sunburn is just down right wrong if you are in the wedding party. Don’t be the one that looks a fool in all the pictures, be sun smart this week. 5. Don’t stress- Stress doesn’t necessarily cause skin conditions but it can make them worse. Relax, don’t worry, be happy. 6. Moisturize- You don’t want chapped lips or flaky skin that won’t take make-up well. Remember to use something really plain and simple that you have used before. No fragrances or colors. If you have never used a facial cream or lotion then do a small test patch over by your ear or somewhere that won’t be noticed. It’s wedding season so I’m sure some of you will be able to put these tips to the test! I can’t wait to get back from maternity leave and see all your smiling faces but until then I would encourage you to go meet Honey and congratulate her on this new chapter in her life. She will take amazing care of your skin too! May is Melanoma Awareness Month and today is Melanoma Monday. 137,000 people will be diagnosed with Melanoma in the US this year according to the Melanoma Research Foundation(MRF). MRF has a campaign going on right now called #getnaked. It is all about educating people to get naked and do your self skin cancer checks at home. Did you know that you are more likely to find your melanoma then a doctor? That’s what the research shows! So it is important that you know your skin and keep an eye on it. 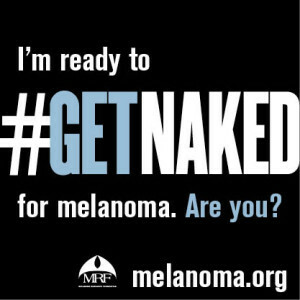 I encourage you to visit http://www.melanoma.org/get-involved/advocacy-initiatives/get-naked and join in on self skin checks. They have some good info on how to do a self skin exam but I thought I would give you some tips here too. 1. Don’t be shy- Your skin is your largest organ so there is a lot of ground to cover. You need to get naked and get in front of a mirror which can be the hardest part for some people. You’re beautiful, you’re important, you’re smart. Be proud to check your skin over, don’t let your insecurities get in the way of checking your skin out. 2. Use a routine so you don’t miss any skin- I like to either start at the top and work my way down, head to toe, or start at the bottom and work my way up, toe to head. You just want to make sure you aren’t missing anything and if you skip around to different body parts it can be hard to remember what you’ve looked at and what you’ve missed. 3. Ask for help- Have your significant other, best friend, Mom or Grandparent check your back and those hard to see places. If you don’t have anyone to look at your skin with you then get a hand held mirror and try to look at those places the best you can. Or grow eyes in the back of your head. 4. Take pictures- Almost everyone reading this probably has a phone with a camera. When you do your skin exam every month take pictures of your moles/freckles that stand out to you. Each month compare your pictures to see if anything is changing or growing in any way (color, size, etc.). If you have growing, new or changing moles get in to see your dermatologist. 5. Don’t forget hard to check places- Under your breasts, bottom of your feet, scalp, behind your ears. Remember, anywhere you have skin you can have a melanoma, not just where the sun has hit you. Ask your dentist, gynecologist and hair dresser to check your skin in places they shine lights that you can’t see quite as well. You should all do a self exam monthly and let a dermatologist check your skin at least once a year. Melanoma can be deadly but when caught early it could save your life. Take care of yourselves and let us help you take care of your skin. 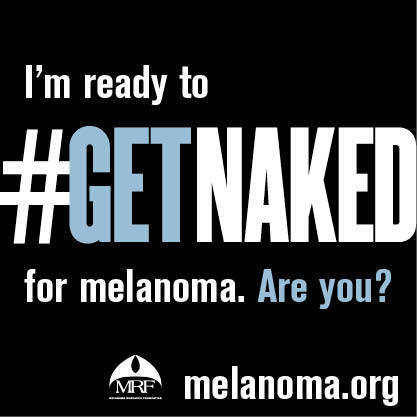 Now go #getnaked for Melanoma!